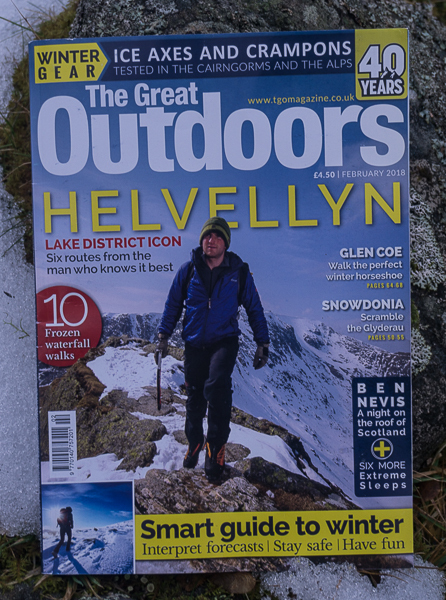 The February issue of The Great Outdoors is out now and unsurprisingly has a wintry feel. On that theme I review ten ice axes and Judy Armstrong reviews six pairs of crampons. I also review the OEX Zenon Ultralight Down Jacket, which has kept me warm on some freezing days in the Cairngorms. The featured winter mountain in this issue is Helvellyn, with a feature by Felltop Assessor Graham Uney including six ascent routes. Other seasonal features, all with mouth-watering photos, involve Phoebe Smith on a winter night alone on the summit of Ben Nevis; Dan Aspel undertaking a snowy scramble on the Y Gribin ridge in Snowdonia; and David Lintern on the wonderful Ballachulish Horseshoe on the edge of Glen Coe. There's a guide to winter conditions too, from Glenmore Lodge Senior Instructor Derek Bain. Away from winter, I tell the story of Rohan Bags, the trousers that started the lightweight legwear revolution. The piece is illustrated with some pictures of me wearing Bags on the Continental Divide Trail back in 1985. In two of them I'm on snow and holding an ice axe so I guess there is a winter connection! Away from the snow for those looking for warm sunshine rather than winter hills Vivienne Crowe goes walking on Gran Canaria. In his Mountain Portrait column Jim Perrin looks at Pen-y-ghent in the Yorkshire Dales. Alex Roddie reviews Hamish Brown's Walking the Song and Roger Smith reviews Ashie Brebner's Beyond the Secret Howff, a book I'm looking forward to reading. Roger Smith also looks at the Thirlmere zipwire proposal, concluding that 'commercialisation such as this cannot be permitted'. This year The Great Outdoors turns forty. This will be celebrated through the year. There's a reader survey so you can tell us what you want from the magazine, either online or via the cut-out form.